​Minkyung Cho is a first year Ph.D. student specializing in Human Development in Context (HDiC). She received her bachelor’s degree in English Education from Ewha Womans University in Seoul, South Korea and earned her master’s degree in Education specializing in TESOL from University of New South Wales in Sydney, Australia. Before coming to UC Irvine, Minkyung was an English teacher at foreign language high school and middle school in Daegu, South Korea. Her experiences of teaching diverse groups of English learners deepened her interest in language acquisition and development and how various factors interact throughout the process. 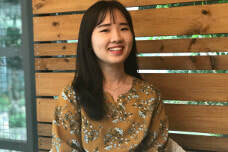 Through the doctoral studies, Minkyung hopes to better understand reading and writing instruction in EFL context and provide helpful guidance to English teachers in Korea.